The Rocksteddy Live in South Cotabato! Band fever caught up once more the delight of almost Filipinos. Indeed, after the entry of this cool band with their own style of humours plainly mixed and seen on their song lyrics definitely made people to simply stop, look and listen. South Cotabato, get up on your feet as KCC Mall of Marbel brings you the band behind the Close-Up Jingle “Smile at Me” and top rated songs like Lagi Mo Na Lang Akong Dinededma and Gising Na, the band who made the theme song titled Superhero for a fantasy show Super Inggo and currently one of the country’s best rock band. 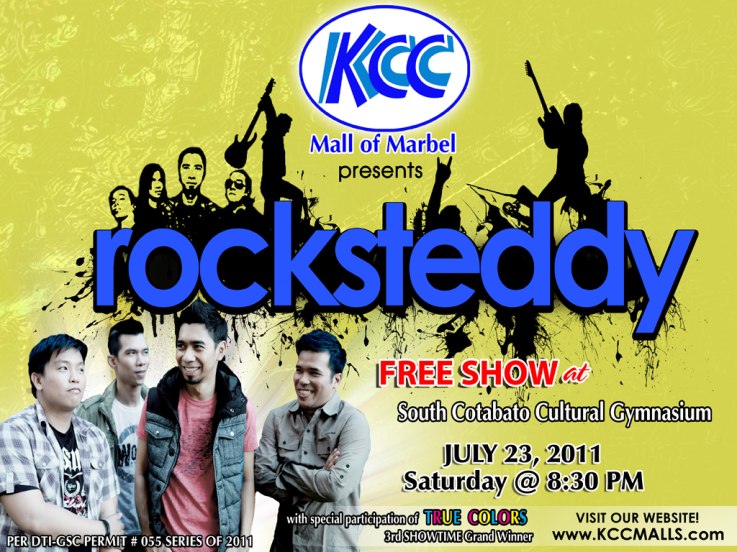 Catch ROCKSTEDDY live in concert at the South Cotabato Gymnasium and Cultural Center this coming July 23, 2011 at 8:30 in the evening with the special participation of the 3rd Showtime Grand Winner - TRUE COLORS. The ROCKSTEDDY Live in South Cotabato is another FREE SHOW brought to us by KCC Mall of Marbel, the province’s leading and best shopping destination.